New AGT800 Startup at Steel Technologies in Smyrna, TN! Advanced Gauging Technologies has completed the startup of a new AGT800 laser thickness gauge at Steel Technologies in Smyrna, Tennessee. The custom built C-frame is specifically designed for use on their 84″ Braner slitter. This laser thickness gauge is used to measure aluminum and various steel alloys with a thickness range of .009″ to .187″. 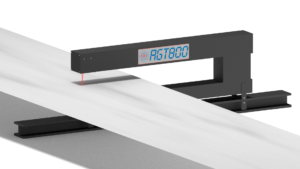 Our AGT800 will allow Steel Technologies to continually meet customers strict thickness specifications by providing extremely accurate non-contact thickness measurement.